I held a free prize draw to win a FULL DAYS FREE TATTOOING as a Christmas ‘Thank-You’ and the name was pulled out at random on the 17th December. And the winner was Carly Bourne! Well Done! 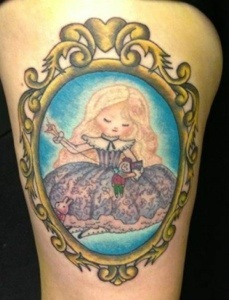 Her chosen design was an Alice in Wonderland inspired design by the brilliant artist Kei Acedera and she wanted it set into a frame to create a thigh tattoo. I did this tattoo just before Christmas on Carly and it came out really nice. I’ll no doubt be doing other competitions in the future, so make sure you check back, or add me as a friend on Facebook to keep upto date.